This patient died in 1931. She was a 14 year old girl. Her illness began 18 days before admission and symptoms were generalised pains, vomiting, fever, delirium and melaena. Her temperature fluctuated between high and subnormal. Her pulse was relatively slow and weakened gradually before she died. 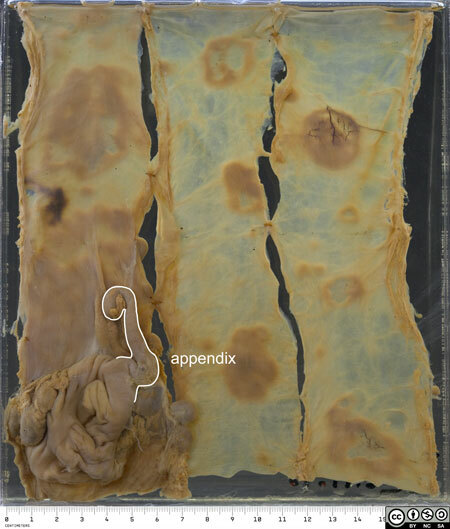 The specimen is the ileocaecal junction and a length of proximal ileum. This view is of the mucosal surface. There are several obvious lesions, which are shaped like Peyer’s patches. The organism, Salmonella typhi, accumulates in lymphoid tissue in Peyer’s patches and causes the patches to become inflamed and ulcerated. 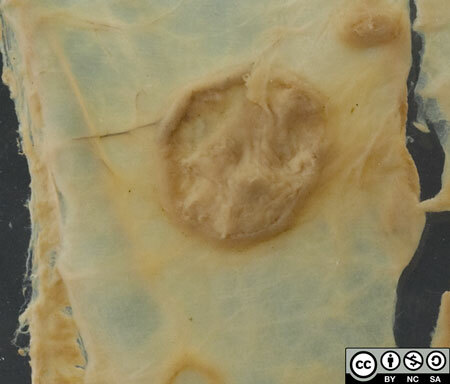 Some of the patches are covered by pseudomembrane. Others have sloughed their membrane, leaving an ulcer bed. In this case, no ulcer has perforated. Our patient instead had another important late complication, bleeding, which occurs as slough separates . Closer view of an ulcer with a slough (pseudomembrane) that has not yet separated. This is a rare example of typhoid ulceration extending to the large bowel. (ref. XVI:iii:9). In the proximal colon there are numerous small ulcers up to 0.5cm in diameter. 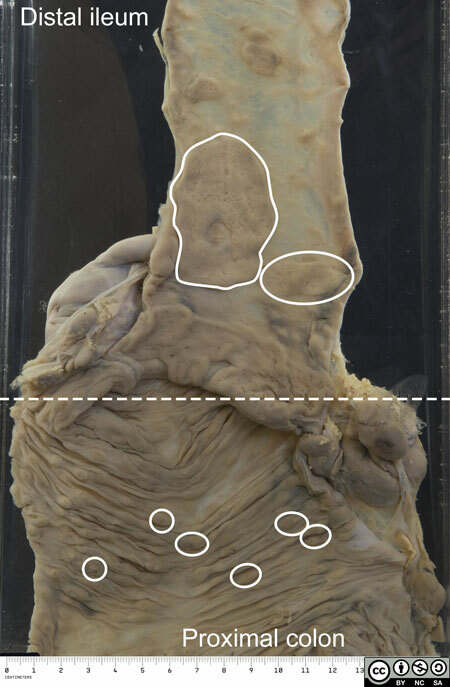 The difference in appearance is due to the fact that in the large bowel the lymphoid tissue is arranged in small nodules and not in large patches. S. typhi survives intracellularly in macrophages. It is disseminated via the reticulo-endothelial system to other organs. It commonly settles in the gall bladder and can cause cholecystitis. There are also systemic effects attributable to its endotoxin. Some survivors of typhoid become asymptomatic carriers and shed the organism in their faeces. Typhoid is spread by poor sanitation and poor hygiene. 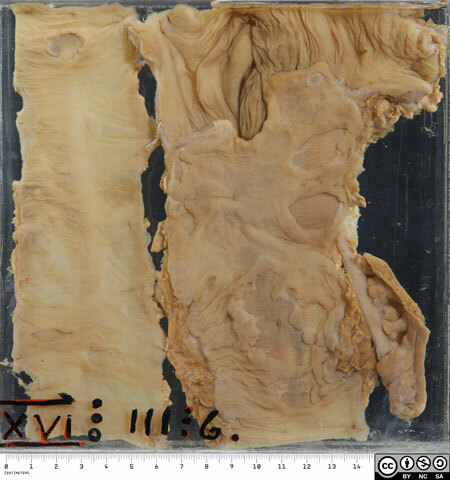 This specimen shows the typical typhoid lesions in the terminal ileum (all have lost their slough). Four members of the family contracted typhoid. The disease was fatal in this patient and one of her children.